Here it is – our brand spanking new Big Splash Giant Inflatable! Join us at its launch tomorrow from 1.30pm to 2.30pm. Children (under 16 yrs) can enjoy this mega twin-track-extreme inflatable, with jumps, slides and hurdles twice a week throughout August. 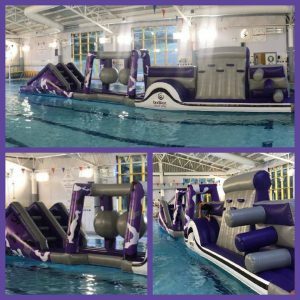 Big Splash Inflatable Sessions take place on a Wednesday from 1.30pm to 2.30pm and Saturdays at 2pm to 3pm during the Summer School Holidays. Go on, dive in! We look forward to welcoming you. Any questions? Please call 01308 427464.